As Ludwig Mies van der Rohe’s 126th birthday comes to a close, a chance to reflect with some well-earned illumination on our wonderful venue: a structure of glass and steel minimalism that would surely please the pioneering Bauhaus architect a great deal. 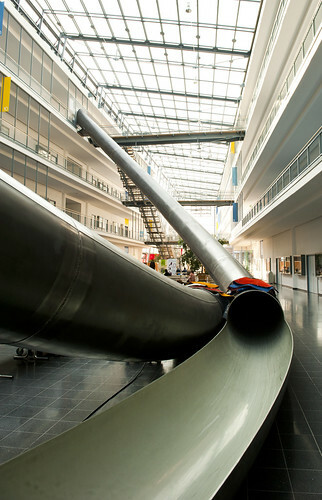 As you can see from Corentin’s previous post, it is a supercomputing centre replete with a somewhat unique method of getting between levels: some tube slides. I’d recommend any architect to include slides in any research building with more than a couple of floors. Today the Gridcast received some promotion from EGI’s Steven Newhouse (who you can also see in Corentin’s previous post, whizzing down the slide). It felt like the community forum had well and truly begun. And what a programme! – First, a welcome speech by Dieter Kranzmuller, a welcomefrom Georg Antretter, Bavarian State Ministry of Sciences, and Arndt Bode, who mentioned Horst Zuse’s very exciting upcoming talk on Friday. This was followed by a talk from Kostas Glinos, talking about how we will progress towards Horizon 2020 European e-Infrastructures – an emphasis on how funding will improve society, as well as promoting excellent science (for its own sake), and competitive industry. Alberto di Meglio had some important things to say about European Middleware Initiatives, including how taking an open source approach could revolutionise e-science in Europe (I’ll stop there, because a future post will give you the lowdown). Later in the day I had the chance to find out about CRAB, a user friendly application that processes, in a distributed fashion, data from the Compact Muon Solenoid experiment at the LHC at CERN; the talk was given by Daniele Spiga. Then, proving that grid is n no way limited to particle physics, an excellent talk from Barbera van Schaik, of Amsterdam’s Academic Medical Centre. My attention was piqued by Go*NL, the genome of the Netherlands project, which aims to understand disease states by the combined genomes of related individuals. Because of this unique criterion of related groups (usually father-mother-child), new mutations can be identified, aiding the research.